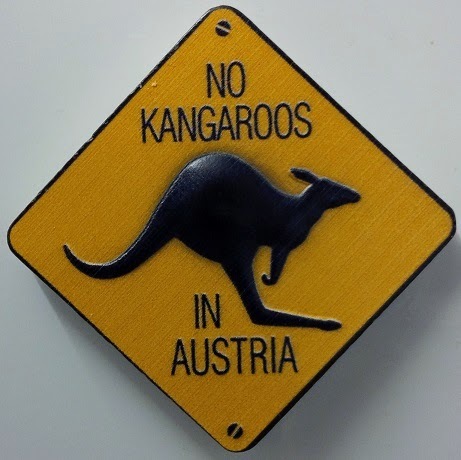 On occasion, signs around Austrian bars and shops selling souvenirs humorously tell tourists to get one basic fact right – there are no kangaroos in Austria! In more ways than one, last week’s OPEC meeting in Vienna was also about getting its 12 member nations to recognise some basic truths – not so much about the absence of marsupials around but rather about surplus oil in the market. Assessing demand, which is tepid in any case at the moment, comes secondary when there is too much of the crude stuff around in the first place. Of late, OPEC has become just a part player, albeit one with a 30% share, in the oil market’s equivalent of supermarket pricing wars on the high street, as the Oilholic discussed on Tip TV. Faced with such a situation, cutting production at the risk of losing market share would have been counterproductive. Not everyone agreed with the idea of maintaining production quota at 30 million barrels per day (bpd). Some members desperate for a higher oil price were dragged around to the viewpoint kicking and screaming. Ultimately, the Saudis made the correct call in refusing to budge from their position of not wanting a cut in production. Though ably supported by Kuwait, UAE and Qatar in his stance, Saudi Oil Minister Ali Al-Naimi effectively sealed the outcome of the meeting well ahead of the formal announcement. Had OPEC decided to cut production, its members would have lost out in a buyers’ market. Had it decided on a production cut and the Saudis flouted it, the whole situation would have been farcical. In any case, what OPEC is producing has remained open to debate since the current level was set in December 2011. The so-called cartel sees members routinely flout set quotas. In the absence of publication of individual members’ quotas, who is producing what is never immediately ascertained. Let’s not forget that Libya and Iraq don’t have set quotas owing to leeway provided in wake of internal strife. All indications are that OPEC is producing above 30 million bpd, in the region of 600,000 barrels upwards or more. Given the wider dynamic, it's best to take in short term pain, despite reservations expressed by Iran, Venezuela and Nigeria, in order to see what unfolds over the coming months. After OPEC’s decision, the market response was pretty predictable but a tad exaggerated. In the hours following Secretary General Abdalla Salem El-Badri’s quote that OPEC had maintained production in the interest of “market equilibrium and global wellbeing”, short sellers were all over both oil futures benchmark. By 21:30 GMT on Friday (the following day), both Brent and WTI had shed in excess of $10 per barrel (see right, click to enlarge). That bearish sentiment prevailed after the decision makes sense, but the market also got a little ahead of itself. The start of this week has been calmer in part recognition of the latter point. 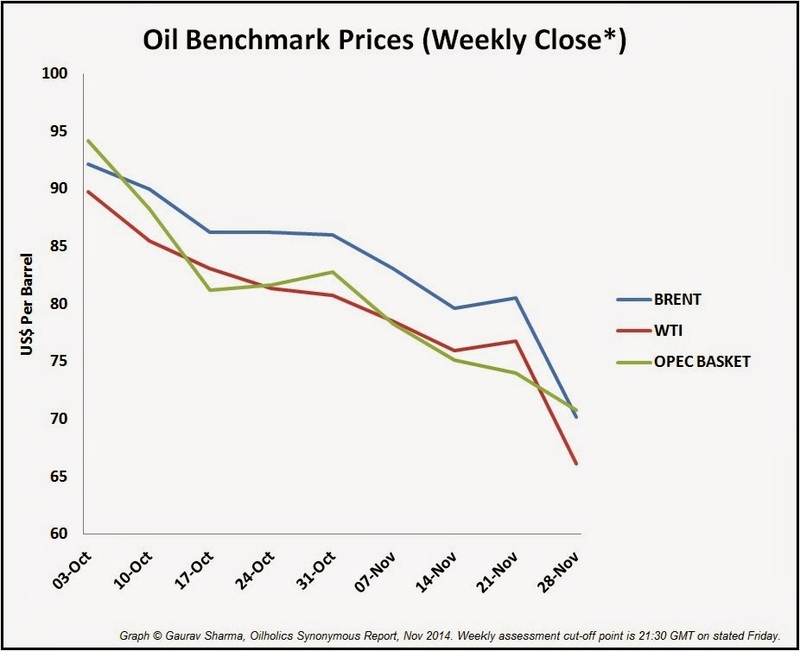 Predictions of $40 per barrel Brent price are slightly exaggerated in the Oilholic’s opinion. Agreed, emerging markets economic activity remains lacklustre. Even India has of late started to disappoint again after an upshot in economic confidence noted in wake of current Prime Minister Narendra Modi’s emphatic election victory in May. Yet, demand is likely to pick-up gradually. Additionally, a price decline extending over a quarter inevitably triggers exploration and production (E&P) project delays if not cancellations, which in turn trigger forward supply forecast alterations. This could kick-in at $60 and provide support to prices. In fact, it could even be at $70 barring, of course, the exception of a severe downturn in which case all bets are off. Much has also been said about OPEC casually declaring it won’t convene again for six months. Part of it fed in to market sentiment last week, but this blogger feels saying anything other than that would have been interpreted as a further sign of panic thereby providing an additional pretext for those going short. Let’s put it this way - should the oil price fall to $40 there will definitely be another OPEC meeting before June! So why announce one now and create a point of expectation? For the moment, OPEC isn’t suffering alone; many producers are feeling different levels of pain. US independent E&P companies (moderate), Canada (mild), Mexico (moderate) and Russia (severe) - would be this blogger's pain level call for the aforementioned. The first quarter of 2015 would be critical and one still sees price stabilisation either side of the $70-level. One minor footnote before taking your leave - amidst the OPEC melee last week, a client note from Moody’s arrived into the Oilholic’s inbox saying the agency expects Chinese demand for refined oil products to increase by 3%-5% per annum through 2015. This compares to 5%-10% in 2010-2012. It also doesn’t expect the benchmark Singapore complex refining margin to weaken substantially below the level of $6 per barrel because lower effective capacity additions and refinery delays will reduce supply, while “the recent easing in oil prices should support product demand.” That’s all for the moment folks! Keep reading, keep it ‘crude’! © Gaurav Sharma 2014. Photo: No Kangaroos in Austria plaque Graph: Weekly closing levels of oil benchmark prices since Oct 3, 2014 to date* © Gaurav Sharma.